There are many creative ways to re-purpose plastic bottles into some useful household items. Plastic bottle craft is a nice way to recycle plastic bottles. Sometimes these crafts are so beautiful that can exceed your expectations. I am excited to share with you this nice project to make a plastic bottle rose lamp. Isn’t that unique and beautiful? The idea is very simple. 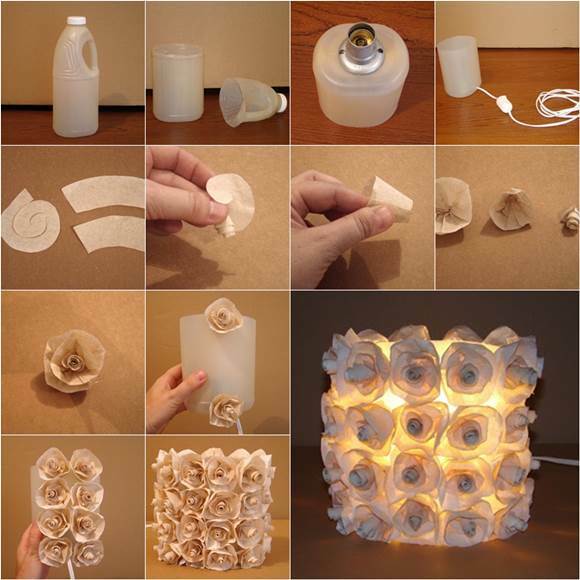 Just cut the bottle in half, install the cord and light bulb, and then decorate the plastic bottle lamp shade with roses made from coffee filter. Let’s try it!